So, I met John and Carol (of Luxury Brands USA) at the DC Pen Show, and they very graciously sent me a couple of inks to review. The first one is this Noodler's ink that I hadn't heard of previously. That might seem surprising unless you consider the sheer number of inks that Nathan at Noodler's creates. Is "gazillion" a real number? I kinda hope so. 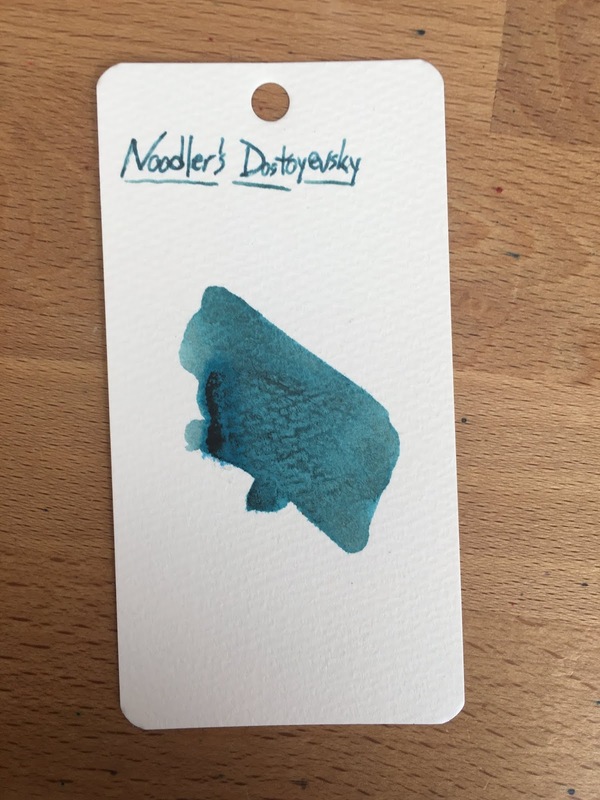 Dostoyevsky is a light blue ink that is really close to being a turquoise, I think. It flows just fine, doesn't dry out in the nib, and the color is interesting. It's just a little too light for me, I think. If it were more saturated I might be all over it. If the written parts were more like the ink smear, I'd really like this one, I think. It looks more complicated there then it does from the nib. You'll see that it looks different from the Lamy nib than it does from the Ondoro's nib. I think the Lamy had some other ink in there, and it contaminated that writing sample. The rest of the review was written with the Ondoro. Why not show it again? This seems to be how it looks best. I can't decided whether it looks better on Rhodia or on copy paper. As I said in the written review, I'm really on the fence with this one. This ink actually seems a little hard to find. Jet Pens lists it as a part of the Russian series, and they list it as an Eternal ink. That might be incorrect, though, as the ink doesn't do well with exposure to water. Goulet doesn't seem to have it. Anderson Pens doesn't seem to have it. Weird. You may have to do a little work to find this one if you're looking for it. I'm using a sample of Dostoyevsky from Goulet, who now carries it. Been on a quest for an interesting, well-behaved, waterproof blue for work and for writing an archival journal to give my son someday. I was hoping Noodler's Midway blue (V-Mail series) would work because the color is great (bright, saturated), but on some papers it's nowhere NEAR water resistant; it spreads so much to become illegible. Dostoyevsky is kinda bright but you're right, like so many bulletproof inks it lacks pop, and it is a bit light for work. To nudge the color, I mixed a sample of 20% Midway 80% Dostoyevsky, and so far that's behaving fairly well. The Midway still bleeds out in water drop tests, but there's not enough of it there to obscure the text. 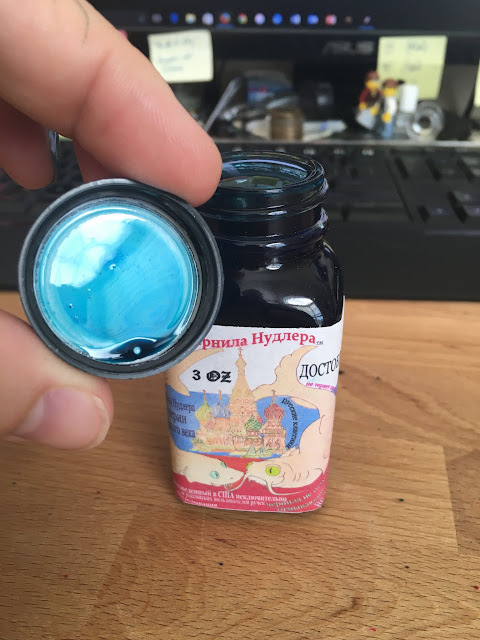 I'm considering a similar blend with Noodler's Upper Ganges Blue, which should be completely water resistant; UGB is good but a little boring and to me spreads even worse than Dostoyevsky. 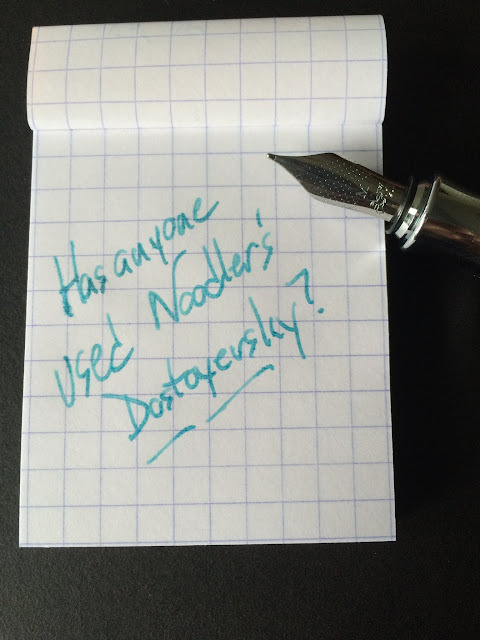 Noodler's Dostoyevsky is the perfect ink for use in a Sailor 1911 Fresca Blue pen. Broader, wetter nibs put down a darker line and the ink is bulletproof.